Cid Hanscom is at it again! – designing really wonderfully creative things. 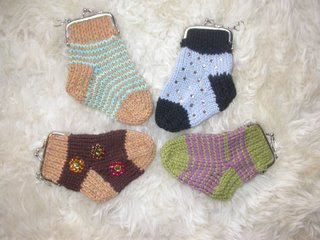 This time she has designed a coin purse that is in the shape of a sock! The kit includes the metal finding for the top of the coin purse, pattern, and a tool to assist in getting the sock into the finding. You provide the yarn and embelishings to create this neat-o cool new use for your socks! Next > >Advanced Studio set to start!